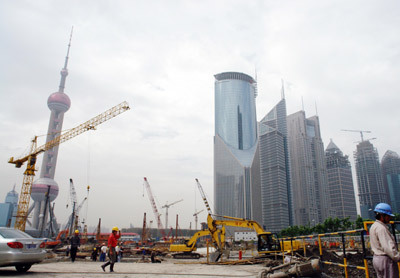 China's economic growth is expected to slow down to 11.4 percent in the third quarter from 11.9 percent in the previous three months, the State Information Center said in a report published on Friday. Inflation will accelerate to 4.3 percent during the third quarter, 1.1 percentage points higher than that in the first half of this year, according to the report. The think-tank under the National Development and Reform Commission, China's top economic planner, attributed the predicted slowdown in Gross Domestic Product to three factors. The government's efforts to curb high-polluting, high-energy consumption industries will affect the overall economic growth, the report said. The effect of the monetary tightening policies adopted in the first half is starting to kick in. It also points to the reduction of export rebates and tightening of processing trade exports, which discourages exports, one of the three key drivers of China's economy. In the third quarter, the country's exports will rise 26.2 percent year-on-year, 0.9 percentage points down from the first half, while imports increase 18.7 percent, 0.5 percentage higher than the first six months, according to the report. Trade surplus in the third quarter may stand at US$77.1 billion, bringing the total in the first nine months to US$189.6 billion for a 72.7 percent increase year-on-year. Another driver of China's economy, fixed assets investment will continue growing in the third quarter, increasing by 26 percent, the report said. The strengths come from entrepreneurs' positive outlook towards overall economic development and strong corporate earnings, offering firms more cash for investment. Consumer spending, an increasingly important impetus, is expected to keep growing rapidly on rising incomes, with retail sales gaining 15.6 percent in the third quarter, up from 15.4 percent in the first half, according to the report. With regards to the Consumer Price Index, a barometer of inflation, the report predicts a year-on-year growth of 4.3 percent in the third quarter, up from 3.2 percent in the first six months. Food prices will continue to rise, and prices for utilities, including water, electricity, and gas may be hiked, further pushing up overall consumer prices, the report said. However, according to the report, widespread, significant inflation is unlikely to occur, citing stable prices in products for consumption and those for manufacturing. The report anticipates the CPI will slow down in the fourth quarter as food prices will gradually fall due to greater supplies.